WBC PROGRAMS: A leaner black & white only version of the WBC Program will be available to all members at WBC registration. Those who have grown accustomed to the comforts of a full color presentation or who cannot wait to get their hands on a printout of the upcoming schedule may download it now in full color at	http://www.boardgamers.org/wbc/schedule.htm in one of three formats: booklet format, spread format or one page per sheet. HOTEL ROOMBLOCKS EXTENDED: Lancaster Host has long been sold out for the 2008 WBC but BPA has group rates at the nearby Red Roof Inn and Continental across the street. These hotels have been recently renovated and offer bargain rates and free continental breakfasts when you ask for the World Boardgaming Championships group rate. However, do not delay. Our group rates and room blocks have been extended to July 17 and when they're gone, they're gone. Lancaster area hotels often sellout during the tourist season. Reserve your room now. Get the details at http://www.boardgamers.org/hotellan.htm. WBC AUCTION PRE-REGISTRATION HALF FULL: BPA's annual WBC game auction in Lancaster, PA on Aug. 5 is well on its way to another sellout with more than half of its 550 Lot limit already registered. Items must be delivered in person on Monday night, Aug. 4 or the following Tuesday morning before noon by registered members. Pre-registration of items for the auction is required. Check out the details and see the items already registered at http://www.boardgamers.org/wbc/auction.htm Download your Lot Forms now. Don't procrastinate! the Auction and Auction Store details carefully to determine which venue is the best choice for their sales items. yesteryear. We no longer will be making shirts on site so if you'd like a souvenir shirt, you need to pre-order it for pickup at the show. expense which will ultimately be passed on to the membership. While ballots can be caste by mail or email also, the technology has been updated to facilitate true on-line voting for the ultimate in convenience at http://www.boardgamers.org/forms/BoardBallot.shtml. for your squad to doncon99@toad.net . Rules are simple. You must have four members. All must be pre-registered to attend WBC and each must indicate a different tournament for his/her team game. Entry is free so give it a shot. The Happy Handicapper, Stuart Tucker, is sharpening his pencil as we assemble the racing form. We update the odds weekly at http://www.boardgamers.org/wbc/teamtour.htm as new teams enter. We will again handicap the field by awarding a bonus point to every player who scores in an event they have not won at a past WBC. Will it make a difference in the crusade by everyone else to stop Nest of Spies from winning their 4th straight team title? Only time will tell. WBC PRE-REGISTRATION/RIDE/CARPOOL/ROOMMATE/TEAMMATE/CHILD CARE SERVICE: If you want to check your pre-registration status or look for a ride, carpooling from an airport, someone to share a room with, a particular Open Gaming itch you want to setup or just another member for your team, check out the WBC Pre-Reg page now on line at http://www.boardgamers.org/wbc/prereg.htm It will be updated weekly as information is received. If you'd like help with any of the above, just email your requests to doncon99@toad.net to be listed on the page. All we ask is that you notify us to remove your listing once your need is fulfilled. And if you can't wait for the pre-reg form to arrive in the mail, you can download a pdf version at the same page. would be reserved for games that can't be played in a day and need to remain setup from day to day. Players would still be required to "play"
we ask everyone's co-operation in keeping the noise to a minimum for the restaurant patrons lest we lose this space in the future. YEARBOOKS: For those who did not receive our annual yearbook in May, an on-line version can be downloaded at http://www.boardgamers.org/yearbook/print/ A limited number will be available for $10 each at registration. See the pre-registration form for ordering information. Late joining Tribune members may also pick up a copy while supplies last. WBC 2008 POSTER: Help spread the word. Download the current WBC poster featuring the artwork of Kurt Miller at http://www.boardgamers.org/wbc/publicity.htm and post it at your next club meeting or ask your local gamestore to display it. rematches of recent games as Pei (2004 WBC Champ and 2007 WBC Runner-up) defeated Young last year in the WBC tournament, and Fedin (2005 WBC Champ and currently the top rated player in the world) defeated Deverell earlier in this tournament. 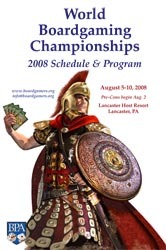 This event began in early 2007 with 62 players, and the tournament website is at	http://mysite.verizon.net/vze4bc94/index.html. 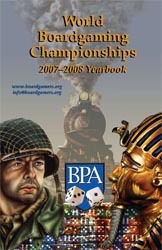 All BPA PBeM tournaments require current BPA membership when the event starts. All multi-day paid attendees to WBC are current BPA members for the balance of that calendar year. Associate Calendar year memberships enabling play in all PBeM events starting in that year cost only $10. You need not keep your membership current in order to finish a PBeM event. Players may join the BPA throughout the year. Members are reminded they can upgrade their current memberships at any time by remitting the additional funds. See http://www.boardgamers.org/bpaterms.htm for details. Last updated 7/7/08 by kae.